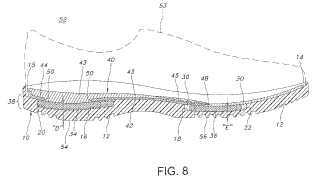 An orthotic shoe sole assembly and an orthotic insole are disclosed herein. The orthotic shoe assembly includes a shoe sole having an exposed surface and at least one exposed cavity accessible via the exposed surface. The at least one exposed cavity includes a central region and a plurality of channels extending from the central region. A resilient member is removably positioned within the central region of the exposed cavity. The resilient member is configured to resiliently expand into at least one of the plurality of channels of the exposed cavity. The orthotic insole is removably positioned to selectively conceal the exposed cavity of the shoe sole and the resilient member. The orthotic insole includes a central axis member for supporting a foot along its central axis.